I arrived at the Isles of Glencoe hotel to find the usual suspects propping up the bar and swilling beer. Anne C and Kenny had spent the day in Glen Coe trying to do a scramble, but the tail end of Hurricane Bawbag had scuppered their plans. And it was wind which would dominate the weekend’s outings, with no snow on the hills and the long settled autumn seemingly over. Any plans for late season rock climbing were quickly dispelled on Saturday, which dawned grey and squally. 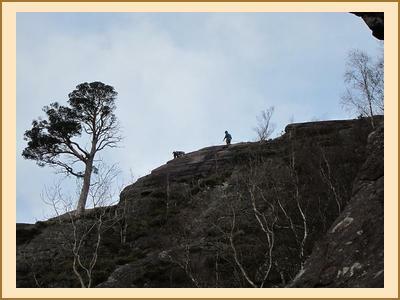 Most people lingered over their breakfasts but Mike and Fiona were away early to climb Creach Bheinn in Appin. 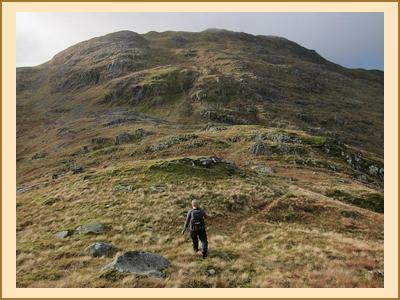 The rest of us scattered far and wide with Pete and Sara on a Munro bagging mission at the west end of the Mamores, while further east Ian, Paul and Bill B tackled Na Gruagaichean and Binnean Mor from Mamore Lodge. Kenny, Alison and Anne C had a surprisingly modest hill day, climbing Beinn na Gucaig and visiting the impressive Inchree Falls on the return. Clearly their minds were set on maximising their time in the hotel pool and sauna. In Glen Coe, Gillian, Kate and Fiona C had a blustery trip along the ridge of Buachaille Etive Beag while Bill C and Eileen walked up Meall Mor from the hotel, skirting below the summit of Sgorr a’Choise on the return. I did a similar circuit in the opposite direction, also throwing in Meall Lighiche in an attempt to get fit for winter climbing. Alison W and Bruce sensibly opted to spend the morning shopping in Fort William before climbing Beinn Bhan in the Great Glen. Despite the blustery start, the day improved to give some fine autumnal sunshine, with the cloud lifting off the summits and the wind dropping away. Dinner was early on Saturday night which unfortunately meant we had to miss the local firework extravaganza in the disused Ballachulish slate quarry. Judging from the number of palettes stacked on the bonfire, it must have been quite a show. Instead, the hotel staff wisely herded us into our own function room where we quickly dispatched with the 3 course meal before the eagerly anticipated President’s speech began. This year’s speech adopted a quietly reflective tone, with less of the fireworks of last year’s special awards ceremony, yet still finding time to highlight the miscreant behaviour of the club’s most colourful bachelor. Who knows what format next year’s speech will take? Sunday saw a max exodus of climbers to Polldubh in Glen Nevis with hopes running high for some late season rock climbing. Despite the pines swaying in the wind, Kenny and Fiona R were not easily deterred from their goal and after an initial recce of the crag, declared that we were on. In spite of a few damp patches and the odd gust of wind to liven things up, some classic lines were climbed including Damnation, Resurrection and The Gutter. Fiona R had her sights firmly set on Clapham Junction but the climb resisted another on-sight attempt by an EMC member, cementing its reputation as a humbling VS. Elsewhere, Kate, Paul and Ian completed a traverse of Fraochaidh from Achadh nan Darach to Ballachulish, enjoying good weather and extensive views of the southern highlands and Mull, while Gillian, Fiona C, Alan and Anne all climbed the Corbett of Beinn a’Chrulaiste behind the Kingshouse Hotel.